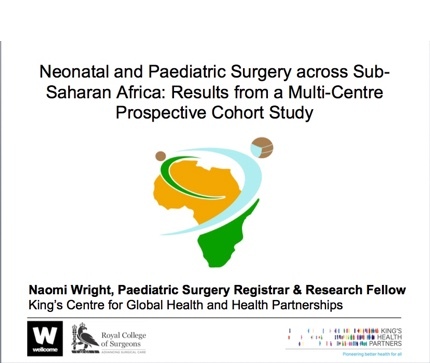 Paediatric Surgery registrar and GICS organizer Naomi Wright earned The Professor BK Sandhu Prize for Gastroenterology at the 15th CAPGAN conference in Lusaka, Zambia in September 2017 for her presentation entitled Neonatal and Paediatric Surgery across Sub-Saharan Africa: Results from a Multi-Centre Prospective Cohort Study. 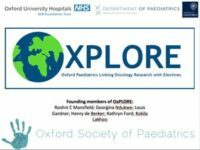 OxPLORE Founders earned first place in the oral presentation competition at the United Kingdom Aspiring Paediatricians Society’s 2nd Annual Conference in Manchester, England in September 2017. Diana Farmer, Inaugural Chair of GICS, gave the APSA Presidential Address in May 2017 entitled: “Audacious Goals — 2.0 The Global Initiative for Children’s Surgery.” The address was subsequently published in the Journal of Pediatric Surgery. GICS member Stephen Bickler gave the 2017 APSA Robert E. Gross Lecture entitled “Out of Africa: Insights from a prospective pediatric surgery database.” The talk was subsequently published in the Journal of Pediatric Surgery. GICS member Naomi Wright won the President’s Prize at the 2018 BAPS meeting for her presentation on PaedSurg Africa, her prospective cohort study to document outcomes on congenital anomalies in Africa.